With all the hype surrounding the Super Bowl, it's easy to forget that in the end, it is still a sporting event. However, if it weren't for the spectacular halftime show, the parties and the special Super Bowl commercials airing during the broadcast, the Super Bowl probably wouldn't be the global event it has become over the years. 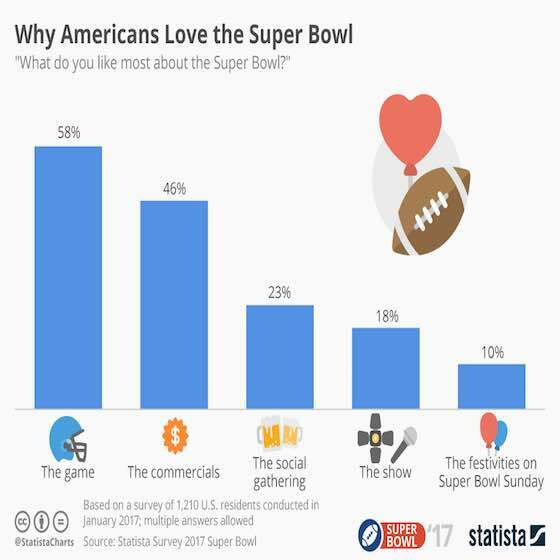 Consequently, it doesn't necessarily come as a surprise that not even 6 in 10 Americans say that the actual game is their favorite thing about the Super Bowl. That is according to Statista's 2017 Super Bowl Survey, which found that the commercials are Americans' second favorite thing about the whole Super Bowl experience. The chart above shows what Americans love most about the Super Bowl. NFL Football: "Why Americans Love the Super Bowl"